Our E-Cigar is perfect for cigar enthusiasts, occasional cigar smokers, or anyone who is looking to try a new type of e-smoking device. Apollo electronic cigars look like they were rolled in the finest Maduro wrapper by skilled artisans. The full-bodied flavor of the finest cigar tobacco. Celebrate without the smoke! Enjoy the best e-cigars in the business. Apollo electronic cigars are the size of a classic Toro size cigar. Just a tad over 6” long and 0.75 inches in diameter. It is a larger unit to accommodate a larger battery than most e-cigarettes and to give it that cigar-like feel when using it. Incredibly long-lasting. It's a great choice for anyone looking to branch out! Especially for cigar lovers! Made by our own R&D department, we promise quality that no other company in the market can dream of. Apollo makes the best e-cigars with the look and feel of the real thing. From the realistic Maduro wrapper to the soft tip. Apollo electronic cigars are disposable. You do not have to worry about recharging or refilling. All you have to do is kick back and enjoy the vapor! Yes, this cigar vape is made for flavor and vapor. The genuine Cuban style cigar flavor is both bold and smooth. What goes into making the best e-cigars? Much like the Central American artisans patiently age and mull the tobacco before carefully and meticulously binding then wrapping a cigar, our R&D team took their time and got this just right. We developed our e-cigar in house at our California base. Our on-site e-liquid lab worked overtime crafting the perfect, authentic, and rich Cuban cigar flavor. Because our lab is on-site, we were able to test and perfect the flavor. Just like a good cigar is crafted from filler, binder, and wrapper, an e-cigar needs only the best components to deliver a pitch-perfect cigar vape. The internal 1,300-mAh battery and large capacity of Cuban tobacco flavored e-juice is designed to last. You can get up to 800 puffs from one single Apollo disposable e-cigar. The quality of the battery, atomizer, and e-liquid follows in the traditions of excellence set by the master cigar makers. An e-cigar is a great way to indulge in the style and tradition of enjoying a fine cigar without the fuss and smoke. You don’t need a cutter, ashtray, or a lighter! Of course the downside is the smoke, mess, and smell. With an e-cigar, there are no ashes or lingering odors. Cigars have long symbolized power and prestige. With cigars we often think of political leaders like Churchill and JFK or perhaps celebrities like Demi Moore and Arnold Schwarzenegger. But cigars are not just for the powerful and famous. An e-cigar is for any adult who enjoys the experience of indulgence but wants to avoid the smoke. The Apollo e-cigar sets the standard for the vapor cigar experience. Cigars are enjoyed by aficionados as well as people celebrating a special event. The closing of a big deal. A big win by your favorite team. Now you can celebrate those events with all of the high-roller style but without the smoke. Celebrate with an electronic cigar! Enjoy our e-cigars on your next poker night or day on the links. 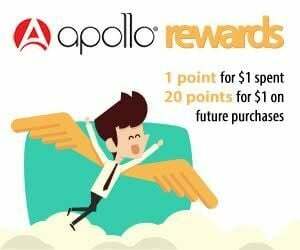 With Apollo’s bulk deal, you can share moments of celebration with your friends. Enjoy those special occasions with the best cigar vape on the market. Don’t overpay for an e-cigar that cannot match our quality and performance. Other companies sell their disposable e-cigars for $30 each. And they don’t even make their own e-liquid! Who knows where they get it. Apollo e-cigars are only $14.95 each and you get more puffs. Not to mention our sweet bulk deals. With Apollo e-cigars, you get it the best products at the best price. i have tried most of the other brand ecigars and this is by far my favorite. enjoyable flavor, longest lasting, and so far i haven't received one faulty cigar !!! adding the discounts and earned credits , you can't find a better buy. thanks apollo !!! Very good for the price. Lightweight. Good battery life. Easy draw. Good smoke production. The flavor is the only thing I’m not crazy about. It reminds me of apple flavored long leaf chewing tobacco, not cigars. Others may like this flavor though so I’m not really knocking it. I just don’t personally care for it. I wish they offered different flavor choices because I’d buy it again and try a different flavor. First time ever an e-cigar. Good taste and good amount of vape. It looks so real, my buddies at work thought I do really puff a real cigar! Taste therefore not really a cigar, but it is all in all an intersting alternative. Whether your indoors, in your vehicle, on a patio or outdoor anywhere, the Apollo Cigar is the perfect companion. The look and feel is that of a real cigar, including the chewable texture of the cigar in your mouth and the draw is instantaneous with a perfect balance of smoke and flavor. Best of all, it bothers know one as it is only a vapor and you just place it back in your pocket until the next time. Perfect convenience, perfect balance, great cigar taste, and reliable performance! I TRIED ONE OF THE CIGARS AND LOVED IT, BOUGHT SOME FOR MY BROTHER, AN AFFICIANATO, AND HE THOUGHT THE FLAVOR A BIT ON THE MILD SIDE ,BUT AS ELECTRIC CIGARS GO QUITE GOOD,AND ADEQUATE FOR USING IN RENTAL CARS ETC, WHILE ON VACATIONS. Love this product and healthier than a real cigar. I’ve tried many other e cigars and this brand is pretty good. The smoke is better than the others and the taste is great. Good product and I would recommend to my friends and repurchase them myself. Taste is twice as good as Cuvana ecigars at half the price! Well made and looks like a real cigar. The soft tip makes it comfortable and realistic to vape. As a regular cigar smoker however, these do not taste anything like an actual cigar. The taste isn't bad but I was looking for an actual tobacco flavor and this wasn't even close. I've been smoking real cigars for quite a few years and have finally developed the ability to recognize a good cigar versus a bad one. But I now would like to limit using real cigars because of the affect they have on my health. I know people that use e cigarettes & they had good things to say, so I started looking for a disposable e cigar to try before I invested in a rechargeable/refillable one. The Apollo proved to be a good choice. Although the flavor is not what I was hoping for, the overall experience has been satisfying enough to convince me to continue with e cigars. This product is good quality & really provides a realistic smoking experience. Weak flavor and vapor. Disappointing product. No other e-cigar is as good as this. Tastes great and lasts as long as they say it does. A good quality product. A+. “Cigar afficianodos” thoughts on this. Been ordering these for a while now. The throat hit and taste are great on these. They always seem to last when they work. However sometimes they are dead on arrival and I ask for replacements. Customer service always helps me so its okay but wish that was something that could be fixed. decent price, long lasting tip. good flavor. seem to last long. so far i am sure i finally found a good ecigar . after trying many brands these are the best. I get these for my Dad and he likes them a lot. They are bit pricey but that’s usually why I buy in bulk and always make sure to use a discount code. It makes him happy and that’s all that really matters to me. after buying numerous e cigars online i finally came across apollos !!!! so far it has the best sweetest taste and great vapor. im thinking these will now be my only brand. especially if they keep them priced as they are at this time !!!! much more bang for the buck compared to all the others. I have been getting these for my husband for a very long time now. These helped him quit smoking and they are very popular. They are very simple to use so these are the only ones he has used. If there are ever any issues I contact support and they always help us out. The only thing I have been purchasing from this company. I like that they last me a few days and tast like a real good cigar. These have helped me quit smoking and I hope they help others as well. I was impressed when i opened the package. More impressed when I took my first drag. Also, my wife is ecstatic. A regular cigar can last a full hour if you nurse it a good amount but this e-cigar goes so much further. I've switched to these since my wife insisted and I've used this cigar quite often for 4 full days. It tastes great and really does the trick. The cigar feels right in the mouth because of the soft tip. The smoke comes out naturally and the draw is even. Worth the price. I bought three to get a better discount. Finally! These are back in stock. When I saw these were back I just had to say something about them. These are so authentic and nice told hold in your hand as if you are holding a real one. It's got excellent flavor and people are always so intrigued when I pull it out and don't light it first. These are so cool and I recommend them to any cigar lover even if you don't want to quit smoking the real stuff. These can get a little pricey when they are the only thing that you use but they work very well and have helped me quit smoking. People always get a kick out of them because they honestly kind of look real. They really make you do a double take to see what is going on! I like these a lot and hope Apollo always continues to carry them. Been a little bit hit or miss lately but the customer service team will always help if anything is wrong. Cigars produce a good amount of smoke, last a long time and taste good. I’ve tried several of these is your garbage such as the epuffer, Cuvana etc. I find Apollo to be the best that I’ve tried. The soft tip gives it a real cigar smoking feel. Has a butterscotch taste but pretty cool alternative to the real thing, just not the same taste. Wish there were more flavors. Like acid flavor cigars. The only down side to this thing is that I have to throw it away when it's out. Rather than buy a new one I wish I could fill it up with some other fun flavor or even recharge this. What I'm really just describing is a cigar shaped vape thing. I just love the way this looks and feels and it seems like a waste to throw it away. But I'm totally happy with the flavor and finished product and will be buying more of them for sure. I feel like vape pens and whatnot is a young man's game. I'm an older guy and I don't know if I could pull off a pen so when I found about this I thought it looked too cool. It feels so casual to hold it and smoke it because it looks so real. Very happy with the taste too. Obviously it's a little different than smoking the real thing but I almost prefer this. I'll have to show it to the other guys in my smoke circle of friends. This thing looks good, feels good in my hands, and it's so authentic. Taste is great and it lasts longer than expected. I love it. many thanks. Obviously this isn't exactly like a real cigar. Real ones have different flavors of the leaf wrapping but that's not a bad thing too. When I get to the end of smoking one the wrapper often comes unwrapped and wet and gets really gross. This e-cigar doesn't do that because, well, it's not real. It lasts longer than a real cigar and it's surprising sturdy. Real ones are easy to squish or break if you're not careful. Not being real has it's upsides. I got this for a birthday gift and I didn't know if I'd like it because it's not real "smoke." I've always smoked cigars on fun occasions so when I got this I didn't expect much but let me say this was pretty neat. It felt like the real thing in my hand. I loved the led light at the tip. Gives it a real authentic look. I bought some more after the first gift and might give one some other smoking buddies. My only reason for a 4 star review is because I wish this had more of a variety of cigar types. There's multiple different types of tobacco flavors in cigars mainly because of the flavor of the leaves it's wrapped in. But the flavor they do have is great and it's fun to use because you don't have to worry about smoke or the smell wherever you are. This cigar is awesome. It's so visually authentic. The light at the end is pretty neat and you don't have worry about it making any ash. The Apollo label ring near the mouth piece gives it a super real look too. Tastes like the real stuff too. My wife got me one of these to see how I liked it vs smoking regular cigars. After the first one I went back to the site and bought the 5 pack with the discount. It definitely is different than the real thing but it has it's perks that my wife likes. I don't smell as much and don't have to brush my teeth all the time. I got this for my father in law because he smokes his cigars in the car. People can't stand driving with him because the car smells of leftover smoke. Hopefully in the time it takes him to smoke this vape cigar, the car smells can air out more. Even if it doesn't, he said he loved the cigar because he could smoke inside and it really is the next best thing. I got these cigars for my friend's bachelor party and they were a hit! We "smoked" them indoors and they had the same great tobacco taste and they lasted longer than the night. We were all able to take them home and use them later too which was a plus. Perfect bach party gifts. The apollo e-cigars look incredible. People sometimes think they are the real thing. They feel awesome. I love the feel of it in my hand. It's not too heavy but not too light. And the taste is awesome. Really good strong cigar taste. I always stock up so I can save some money on these in the long run. This is the best tasting electronic cigar I have ever had, and I've tried a bunch. I was an occasional cigar smoker and these things are even better than the real thing. Plus, I can puff on one for about 8 days until it quits. Try puffing on a real cigar for that long. I will definitely be buying more of these cigars. Bravo Apollo eCigs for a great cigar. I love this product, one of the things I hated about giving up smoking was giving up cigars. These do the trick for me. Great e cigar. I've tried quite a few types and this is one of the best. Postage to Oz is **** though. Good product. Will order again. Fast courteous service and able to connect online for any issues! Loved the cigar. Very tasty. Very satisfying. Good value, but smoke a bit harsh. Been a pipe & cigar smoker since my Navy days. This has a good flavor and no burn. Well done. I gave up cigarettes and found these great cigars which last and have a full, smooth, flavor! I order them by the 12pack every 2-3 weeks and am never without them now. I've been using Apollo e-liquid for a while now and thought I'd give your e-cigar a try. The smoke is smooth, and the flavor is outstanding. If you bottled and offered this flavor of e-liquid, there's nothing else I'd use! PUH-LEEEAZE offer this in 30ml bottles!!!! It's the BEST flavor of any I've tasted so far! Hey Apollo you guys should start selling the ejuice from this cigar. This is by far the best tasting product that Have tired. I have tried all the different juices from JC, V2, and your own product line. This cigar has the most authentic flavor out of any I've tasted. This cigar is a quality product, for the price it cant be beat! I've been an occasional cigar smoker for about 5 years. When I decided to quit smoking I was pretty bummed because I really enjoyed hanging out with folks in the cigar lounge (or outside area). Having great experience with Apollo (Extreme pen style and eGo VV) I got one of these. And man, it's great. Just this last weekend, I was with a group of cigar folks and was happily puffing along with them. I let a few people take hits off mine and I think Apollo's going to get a bit more business from that. The flavor is deep and round, a bit sweet but really lovely. Best of all was no smell in my hair, clothes, etc. All the good without my sweetie saying "go shower before you go to bed." Does the tip glow red? I need one for a play with a red glowing end. Hi, yes the tip is glowing red. Is there a rechargeable battery and adapter included? Hi, this is a disposable item. Once the battery is depleeted you cannot recharge or reuse it.